Finished! 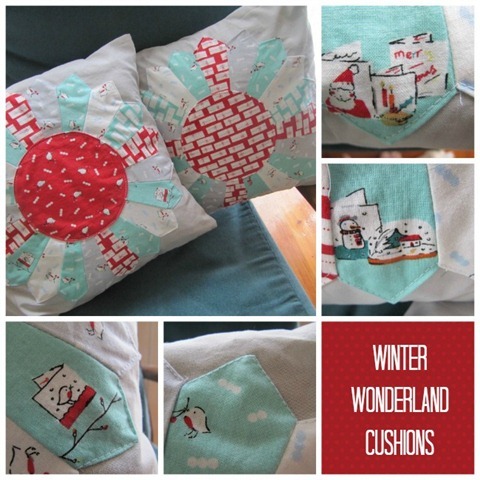 A pair of dresden plate cushions using prints from Aneela Hoey’s ‘Cherry Christmas’ range. These are my first dresden plate blocks and they are fun to do. I wasn’t overly precise with these as something I learned this year is that I need to stop trying to make things 100% perfect and finish them instead. It works as once I have a finished piece I love it and don’t notice obsess over the flaws whereas in the past I rarely got to the finish line. The only thing that would make me more happier with them is plumper cushion inserts! Another one down, lots more to go! I love plump cushions too, and am continuously a little disappointed by the inserts we can get down here. Except the ikea feather ones. Those things are insane! But unfortunately not very local. So I buy Spotlight inserts, rip a hole in the seam and stuff more filling in, then sew it up again. Ta da!